Toilets are the most heavily utilized place in the home - followed by bedrooms and depending on your lifestyle; living room and kitchen. Therefore, its not surprising to find yourself faced with tile grouting, silicon lining for the shower glass panel which has turned green or even black! For us, our ceiling even showed patches of green furry mould growing at an astonishing rate. No matter how many times the grouts and lining are breached, scrubbed and disinfected, the green, black organic fungal creatures kept coming back, as if determined to stay on for good. I noticed this problem usually plagues flat owners of toilets with smaller windows with poor ventilation. 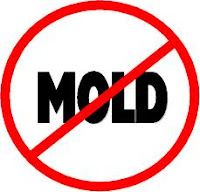 As a result, mould growth at the corners, tile grouts and silicon linings becomes a chronic problem since mould and fungal bacteria thrives in moist humid environment. Simple, ensure that your toilet is well ventilated by keeping the toilet door and windows open after you have used it. However, in some cases, there will still be mould growth at certain corners of tile grouts, silicon linings and even ceiling. Thus it is best to use mould repellent paint for the ceiling, regrout the tile grout and silicon lining with mould repellent grout or silicon. For new flat owners, you should consider getting the toilet treated with mould repellent materials during your renovation.